Moodle’s powerful, flexible and customisable learning management system helps you deliver effective corporate training and professional development, and share knowledge across your organisation. We are proud to have held Moodle partner status since 2005 and consider ourselves an active community member, always willing to contribute our expert resources and developments to the Moodle community. This ensures that Moodle continues it’s development and remains as the leading, free, open-source learning platform. Establish training paths for your employees grouping courses and content into programs. Create recurring certifications based on programs with a de ned validity period that need to be retaken and keep your employee certifications up to date. 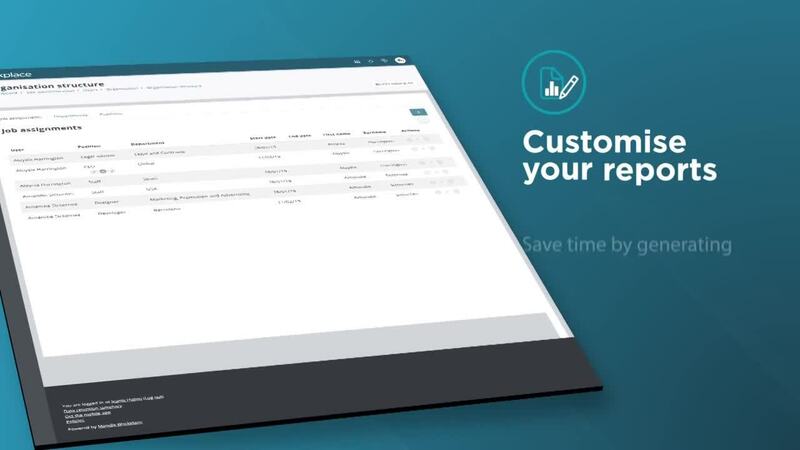 Save time by generating your reports easily in a drag and drop interface with instant preview filtering and aggregating any data in the internal Learning Record DataStore (LRD). Schedule reports to be sent automatically to different audiences. Empower your people to engage in their learning and development from anywhere on any device. Moodle allows you to develop a fully branded Workplace App for a completely customised experience. Moodle Workplace’s multi- tenancy architecture allows you to give each of your divisions, departments or franchises their own full LMS platform. Choose which permissions you give each tenant and delegate the LMS management to the people actually doing the job. Adapt the software to your company structure defining roles and hierarchies that automatically create reporting lines. Assign management rights and security permissions to each role. A highly customisable interface with a clean design that can be tailored to any need, enabling you to easily add shortcuts to admin features and optimise system management. Sync your workforce training and development with HR systems importing and exporting the company structure, position frameworks and job assignments for your users. Save on your admin time by automating course enrolments, certification allocations or security management for different user groups with a set of ‘if-this-then-that’ rules that you can de ne, template and save. Our expert technicians fully manage the hosting of your Moodle, ensuring your site is available 24/7. We know Moodle and we know hosting but what’s important for us to know is all about you, your users and their requirements. This will enable us to provide you with the most suitable hosting package and the best service. On our Moodle training days you spend the majority of the time doing, rather than listening. We believe learning should be fun, but fundamentally, it must generate results and provide transferable skills. Synergy Learning is highly skilled in creating Moodle themes according to an organisation’s visual identity guidelines. Our team of talented designers are experienced in and driven to transforming a Moodle site into a user friendly, and intuitive site..